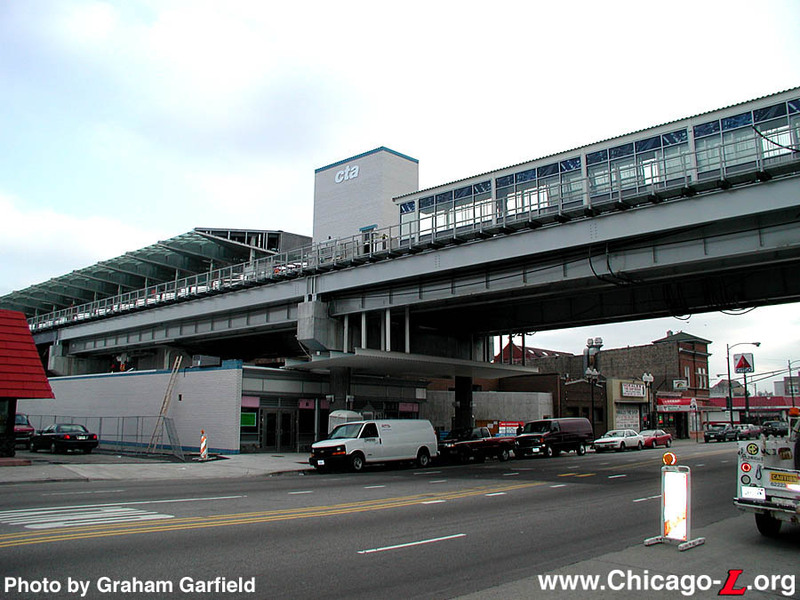 The Douglas Park branch of the Metropolitan West Side Elevated Railroad (the 'Met') was originally planned to extend to 46th (Kenton) Avenue in its original stretch. The branch, however, actually opened in incremental stages. On April 28, 1896, the branch opened between Marshfield Avenue junction, where it left the Met main line, and 18th Street. 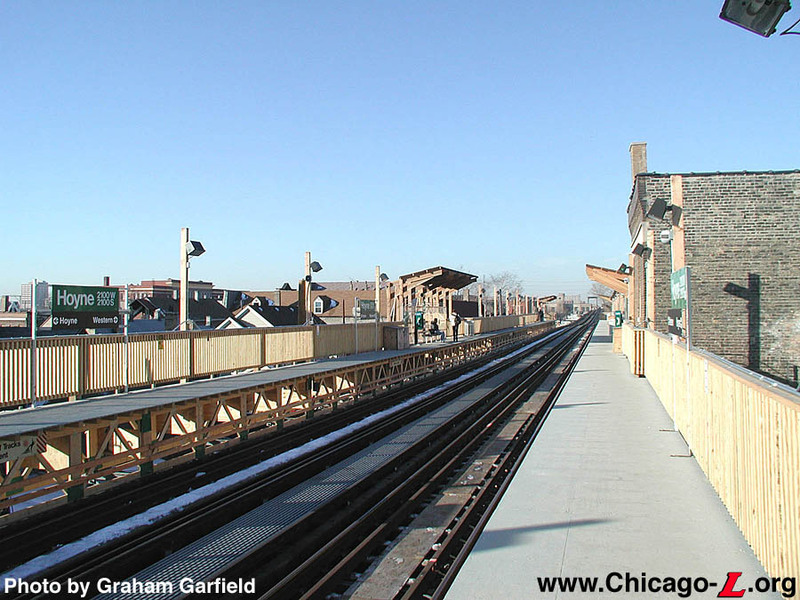 Just over three months later, on August 7, 1896, service was extended to Western Avenue. Western remained the terminal of the branch for six years, until the next extension opened on March 10, 1902, though the station was not designed in any appreciable way to serve as a terminal. In fact, it was designed in the same configuration was most other "through" stations and simply functioned as a stub-end terminal. 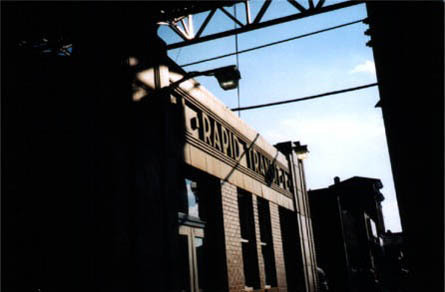 The original station was typical of those on the original 1896 portion of the Douglas Park branch, a largely rectangular building with a bay extending approximately five feet in front of the building. The one-story headhouse, situated beneath the elevated structure, employed an unusual vernacular form with influences from the Craftsman and even Prairie School styles. The exterior walls were clad in dark red/brown bricks while a rusticated stone base lined the bottom of the wall at ground level while the corners had stone quoins. The Craftsman influences came through in the wide overhanging eaves with exposed rafters and the battered half-timbered treatment over the front entrance, while the Prairie School style can be seen in the low pitched roof, extended eaves (one of several qualities shared with the Craftsman) and tall, thin, banded windows on the side elevations. After passengers paid their fare and passed into the paid area, they began their trek up to the platforms. One central staircase led from the station house to a mezzanine level beneath the tracks. Part of this central staircase was enclosed, with swinging wood and glass doors at the top of the stairs. From this mezzanine landing, the stairs split to the inbound and outside platforms. Each one of these staircases also split at an intermediate level, allowing customers to enter and leave the platform from one of two locations, a helpful arrangement for passenger flow during heavy use rush hours. The stair railing structure was somewhat decorative, with curved and twisted strap metal balustrades, cast iron newel posts with small designs cast in them and carved wooden handgrips. A series of square cast iron plates with a square-in-square design of descending size were placed along the bottom of the railing near the stair treads. 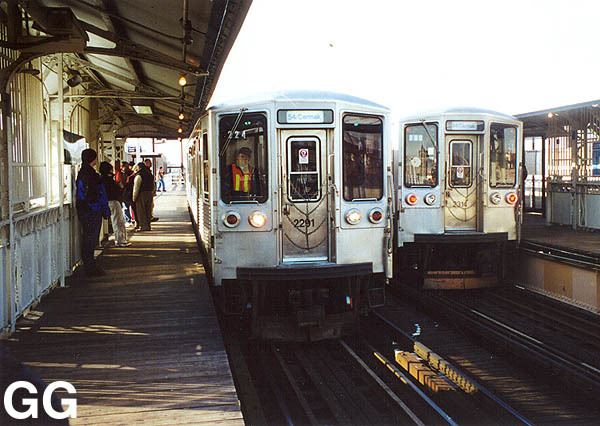 The dual side platforms were each nearly identical to each other and to other Met station platforms. The flooring was treated timber planks, while the railings and balustrades were similar to those on the stairs. Added to the railing design here were larger cast iron square plates with a stylized diamond design cast into them. Each platform had a short canopy in the center of the platform, covering the stairs and a small waiting area. The canopy frame was steel, with latticed supports and bracketed rafters. The canopies had hipped roofs of corrugated metal. Strung beneath the canopy roof were incandescent lights for nighttime illumination. 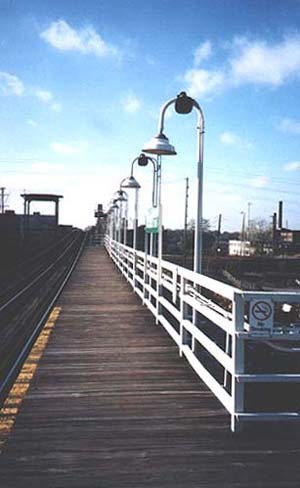 The platforms were additionally lit by gooseneck lamps that were integrated into the railing design, with certain posts extending above the railing -- above seven feet high, total -- and forming the fluted pole with a decorative capital onto which a gooseneck light fixture with a porcelain saucer-shaped shade with two or three incandescent light bulbs was attached. As occurred with most "L" stations, several modifications were later made to the Western station facility. Perhaps the most important was to the front facade (west elevation). In the 1930s, Western Avenue, the longest street in Chicago and an important north-south thoroughfare, was widened for its entire length. The Metropolitan Elevated had four stations along Western on various branches and used an usual solution to the encroachment on their property. Instead of demolishing the station houses wholesale and erecting a new buildings further back on their property, the Met retained their station buildings, cropped off their fronts, removed several feet from the footprint of the structure, and added a new front facade at the new property line. Rather than try to design a new front to mesh with the style of the original building, the new fronts used a radically different, decidedly modern style. 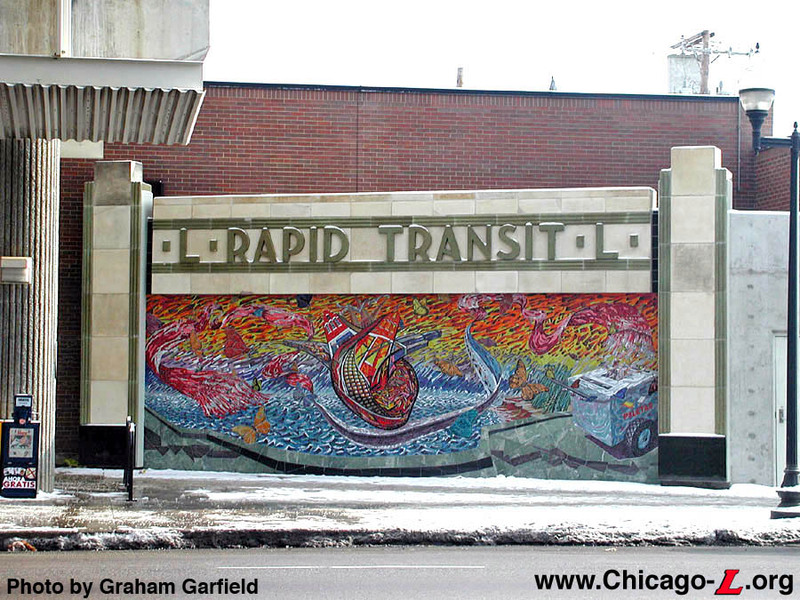 Arthur U. Gerber, by then the staff architect for Chicago Rapid Transit Company and other Insull rail properties, designed a new facade, which was installed circa 1935. The new Art Deco/Moderne facade of tan and olive green glazed terra cotta and tile is a stark contrast to the brick Craftsman side elevations. The central portion of the street elevation contains two metal frame windows flanked on each side by a set of swinging wood and glass doors topped with transoms. This area is framed by a set of tan glazed piers with olive green "piping" and topped with band containing the words "L  RAPID TRANSIT  L" in green Art Deco lettering. The new facade was installed by William Grace and Company. The use of the Art Deco style for the facade was fashionable at the time, but made for a very unusual and unique combination with the original Craftsman sides and rear. Although the addition of the modern facade was perhaps the most severe change to the station, several other modifications were performed as time went on. The interior has been largely changed since the station house was built, with the most severe rearrangement occurring when the Deco front was added and the building was cut back. At the same time as the front truncation, an addition was also put on the south side of the building to compensate for some of the lost square footage. The walls were plaster from the ceiling to a molding about seven feet up from the floor; below the molding, the walls were covered with metal sheeting, at least by the time of the station's later years. The original built-in wooden agent's booth was removed, replaced with a small, plain, square wooden booth with a metal screen. The interior floor was covered by a wall-to-wall treaded rubber matting in later decades. The central portion of the street elevation was later clad in tan glazed bricks rather than the original terra cotta, the result of an accident circa the late 1980s. Two modern sodium vapor lights were added at the roofline later to add additional lighting. The platforms and stairs are largely intact, but have seen some modest alterations. 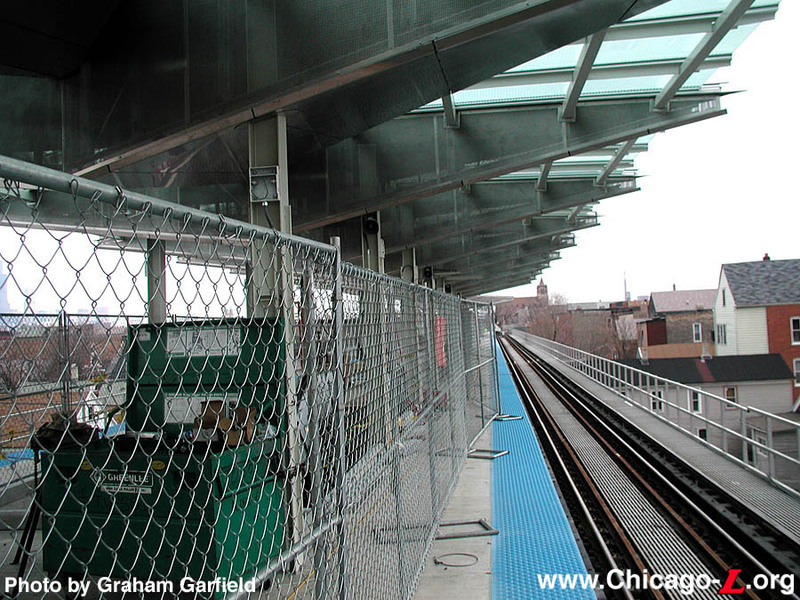 Metal mesh panels were later added to some parts of the stairs to provide better protection of the stairway. 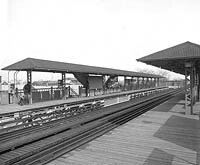 The original canopies and railings remained on the old sections of the platforms, and the canopy on the outbound platform was later lengthened at its east end to a point where it was about twice as long as the inbound canopy. The platforms were extended as train lengths got longer and the original Met platform lights were replaced with the simpler tube pipe shepherd's crook lights there were standard elsewhere on the system. The Western station was an unusual and unique structure on the Chicago rapid transit system. 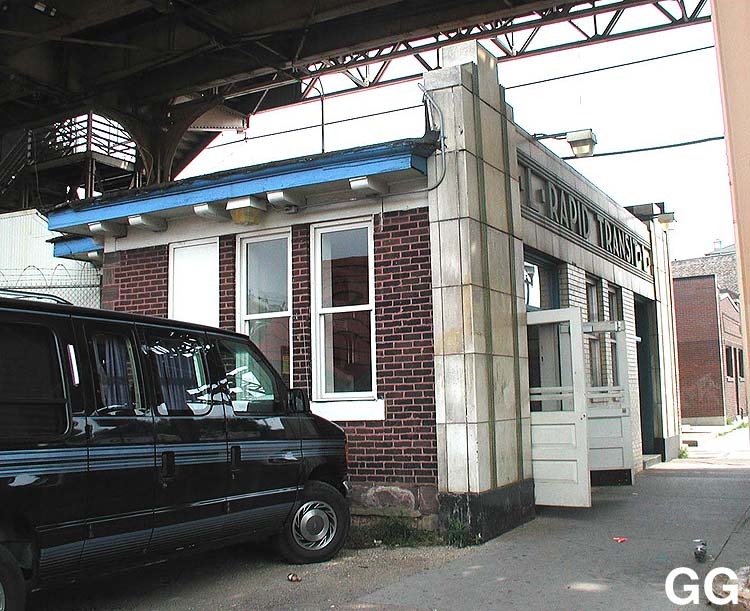 While there were once four such stations on the various Metropolitan Division branches, the Douglas branch station was the last to be removed or altered. 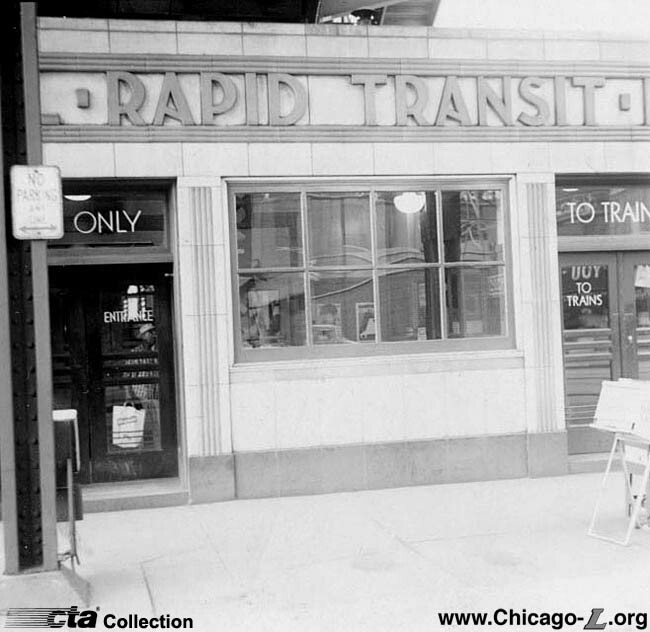 The Humboldt Park branch was closed in 1952 by the CTA and subsequently dismantled. 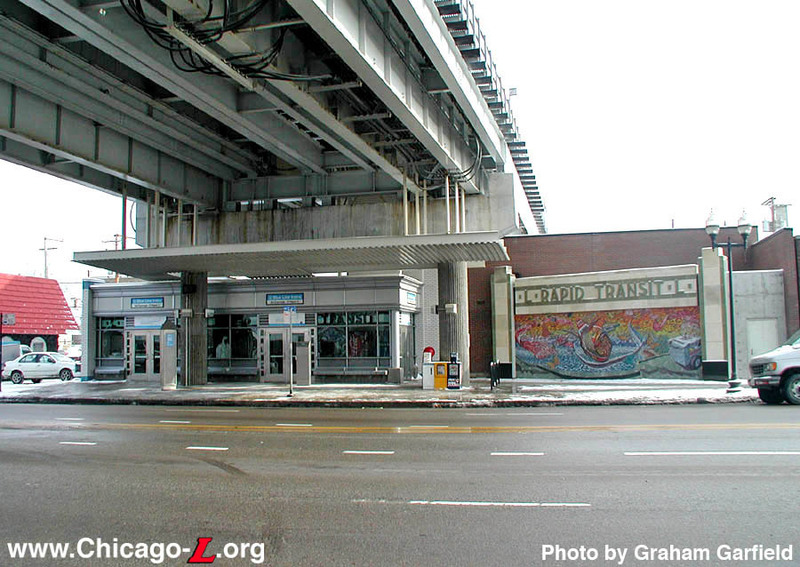 The Garfield Park branch was razed in 1953 to make way for the Congress (later Eisenhower) Expressway and new Congress Line rapid transit facility, which ran in the path of the old elevated line and included a new Western station. Until the summer of 2000, the Western station on the Milwaukee/O'Hare branch remained intact, but the CTA then began a capital improvement project to build a new station. The Art Moderne facade and the north elevation of the original 19th century building were salvaged but the rest was demolished, amounting to what preservationists often call a "facadectomy." By the early 21st century, this left the Western station on the Douglas branch the only intact example of this very unusual architectural treatment. 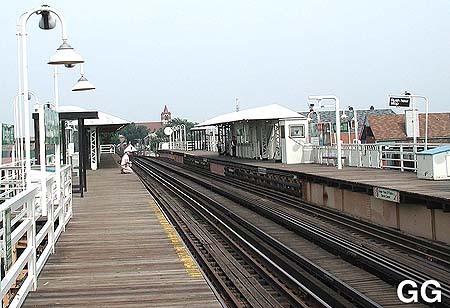 The Western stations were also a rare example of the Art Moderne style on the "L". The State Street and Milwaukee-Dearborn Subways (begun in 1938 as a WPA project and completed in 1943 and 1951, respectively) also use an Art Moderne style in the station mezzanines, but it is a very streamlined, simple application of the style. Western is unusual for its more decorative take on the style and the use of Art Deco ornamentation. By the time of new millennium, the station was aging and in need of renovation. Over the years, the condition of the Douglas branch deteriorated to a point that permanent "slow zones" were present throughout more than 47% of track and many of the stations were in poor condition. 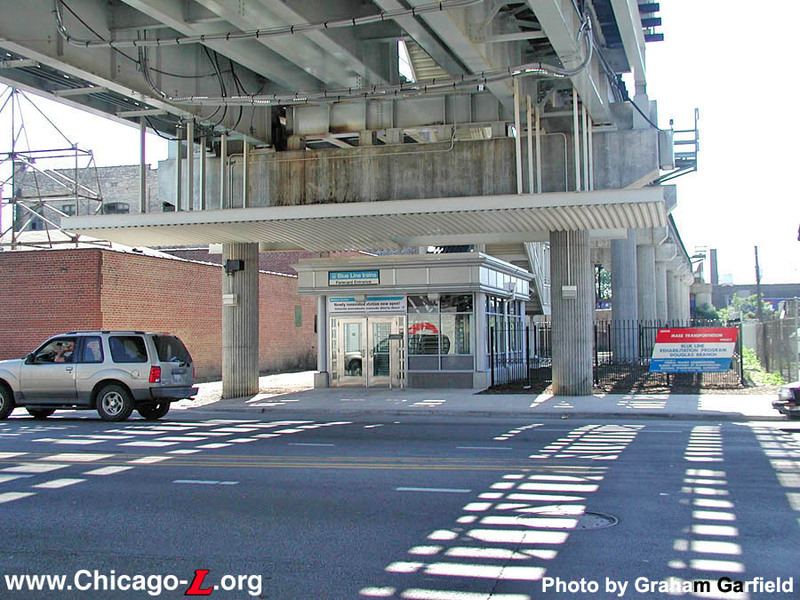 After a long battle to secure funding from both the state and federal governments, the CTA decided it was time to embark upon a complete rehabilitation of the entire branch. The Douglas Rehabilitation Project was the largest single capital improvement project the authority had embarked upon up to that time. The project was to restore the branch so that it would be 100 percent ADA compliant with eight of the branch's 11 stations (six elevated and two at-grade) completely rebuilt and to allow for faster travel times from one end of the line to the other. As part of the renovation project, Western was replaced with an entirely new station facility. The new headhouse is a modern glass and steel facility on the east side of Western Avenue, where the original station house was formerly located. The building exterior features quarry tile at the base, a metal-frame storefront on the front and side facades with large picture windows, glass walls and a band of art glass along the top, and capped by a large metal cornice divided into boxes. The art glass on the front facade reproduces the Art Deco lettering that was on the dismantled 1930s addition. A small plaza is located to the south of the station, in front of the adjacent Western Substation that, in part, powers the branch's third rail. The interior features white ceramic glazed tile walls, a waiting area in the unpaid area with seats for waiting bus riders, fare controls, fare vending machines, a customer assistant booth, and various auxiliary equipment rooms. The old side platforms are replaced with a new, wide island platform. The new canopies were designed as "showpiece" structures, with clear glazed roof sections that allow natural light on the platform alternating with triangular solid, three-dimensional metal wedges and clear triangular panels that led the canopies to be dubbed by some as the "flying triangles". 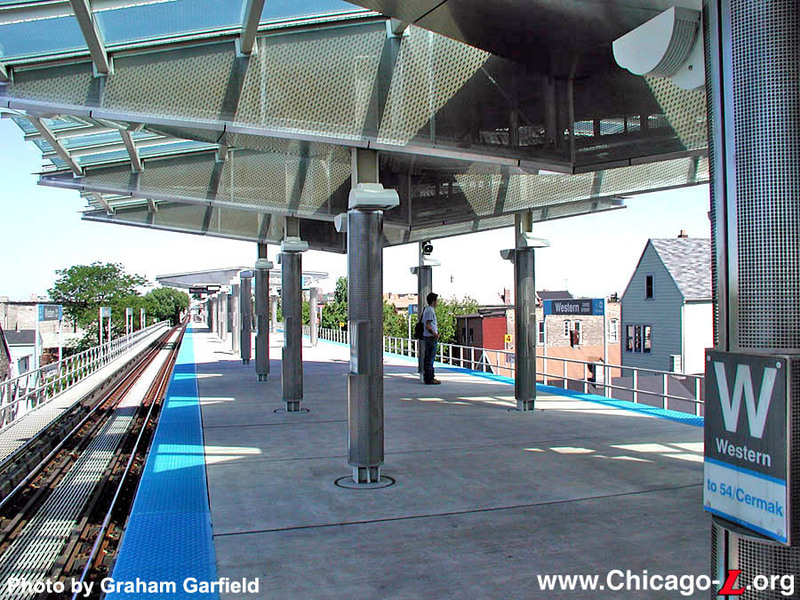 "Honeycomb" paneling adorns the platform canopy fascia, as well as being around the various columns and poles at platform level. A new elevator provides ADA access, with the tall elevator tower cladded in white tiles with a blue band around the top and a steel "cta" on the north and south sides dominating the street elevation the facility. 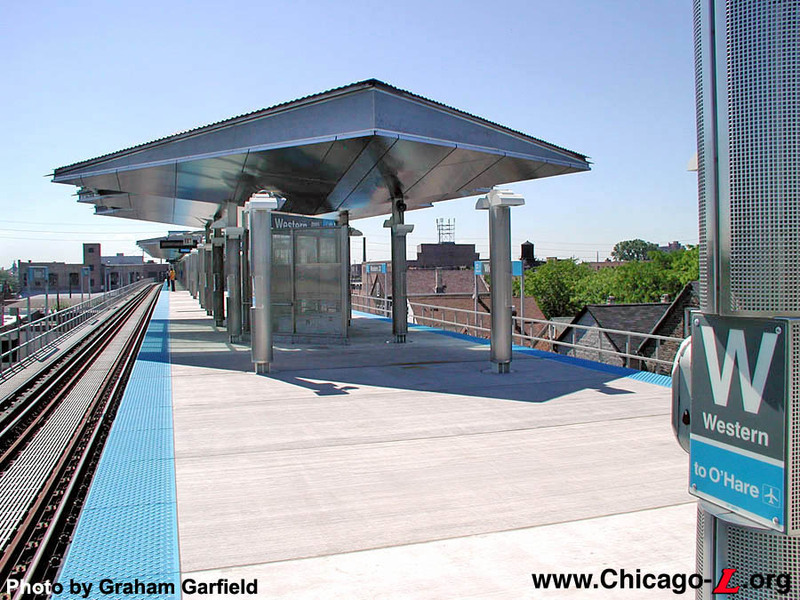 The platform amenities carry through the angled motif of the canopy, with benches, lights, windbreaks, and some signage angled off-axis from being parallel or perpendicular to the tracks. 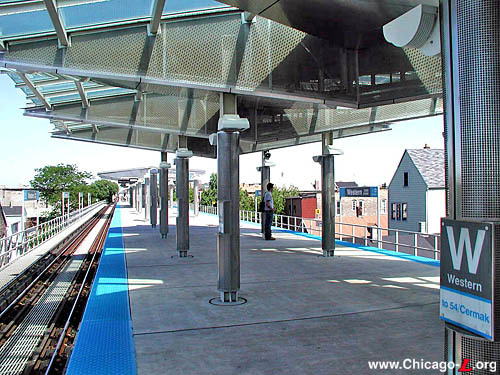 For customer comfort, the platform features benches, overhead heaters and enhanced lighting. In addition to the elevator, a wheelchair-accessible gate in the fare controls, TTY telephones, tactile edging and Braille signs offer accessibility for customers with disabilities. Audiovisual station signs and a public address system help customers navigate the station and receive travel information. There is an auxiliary entrance and exit on the west side of Western Avenue, across from the main station house. This farecard-only entrance is enclosed inside a small station house whose exterior design resembles a miniaturized version of the primary headhouse. Inside are two high-barrier gates (HBGs), a transit information board, and a customer assistant call button. 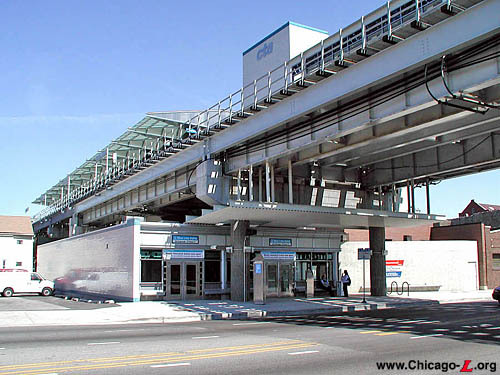 The auxiliary entrance is connected to the platform by way of a platform-level pedestrian walkway bridge, which spans the width of Western Avenue. 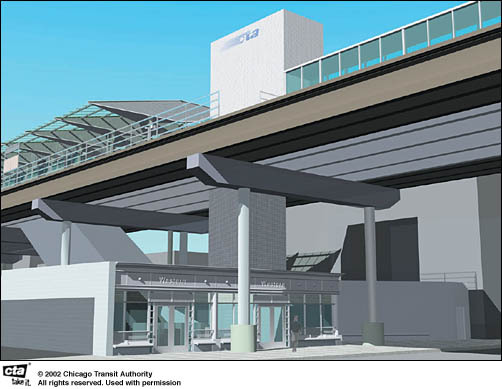 The bridge -- with one side enclosed with a metal framed curtain wall with glass panels and the other with a decorative metal grille -- protects customers from inclement weather while providing convenient, direct connections to the southbound Western Avenue buses, the #49 and #X49. 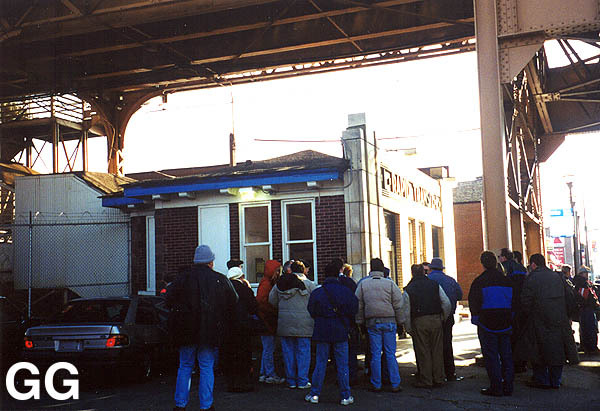 The official groundbreaking for the Douglas Rehabilitation Project -- also known as "Renew the Blue" -- took place at Pulaski station on September 10, 2001, but actual construction work did not begin at Western station for over a year as crews worked on stations and structure farther west. 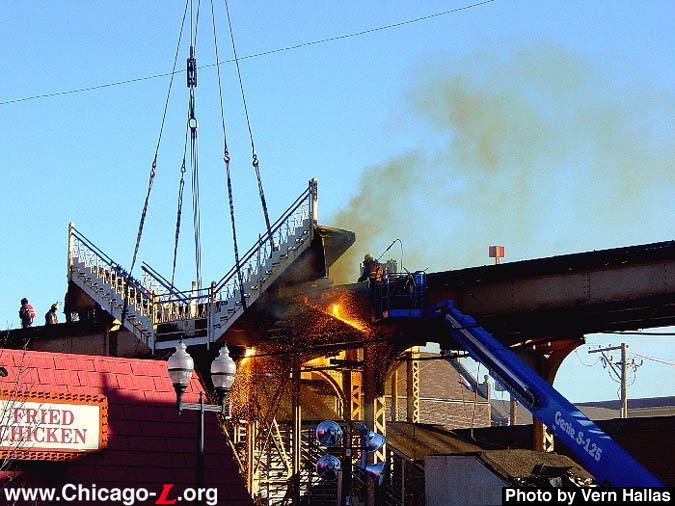 Crews began dismantling the Art Deco facade of the Western station during the week of October 20, 2002. Interestingly, the facade was not demolished, but seemed to be very carefully removed piece by piece. The work was largely completed by the end of the week. Early in the morning at the conclusion of weekday service on Saturday, November 30, 2002, the Western station closed for reconstruction. Effective at 0400 hours, the station closed pending its demolition and replacement with new facilities. 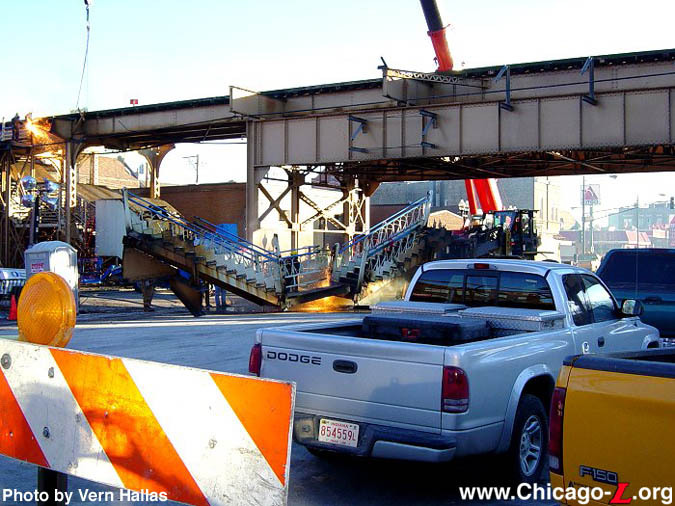 While the work is in progress, the temporary Western-Hoyne station with entrances at Leavitt (two blocks east of Western) and at Cullerton (a half block west of Hoyne) served customers from both stations. 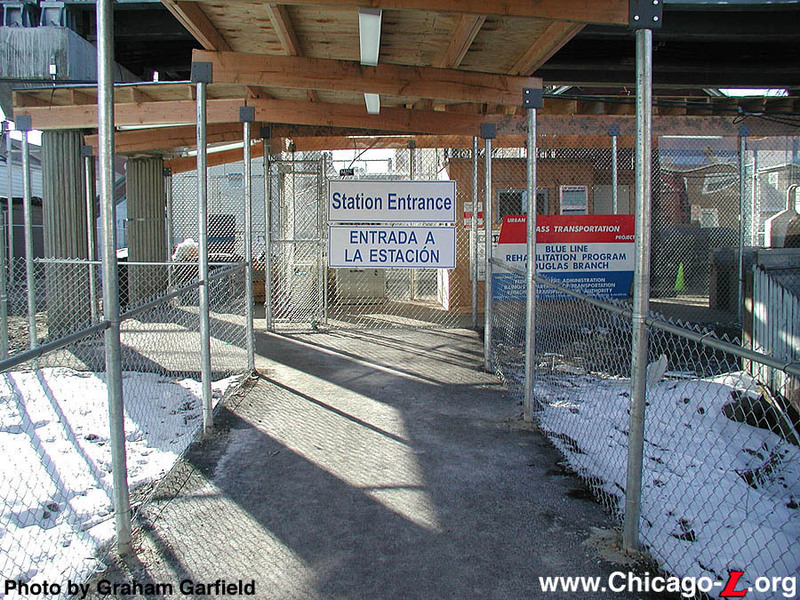 The Western-Hoyne temporary station was placed in service at 0400 hours on Monday, December 2, 2002. Customers continued making bus connections with the #49 Western and the #X49 Western Express buses at 21st/Western. The temporary station featured temporary wooden dual side platforms in the vicinity of Leavitt Street. 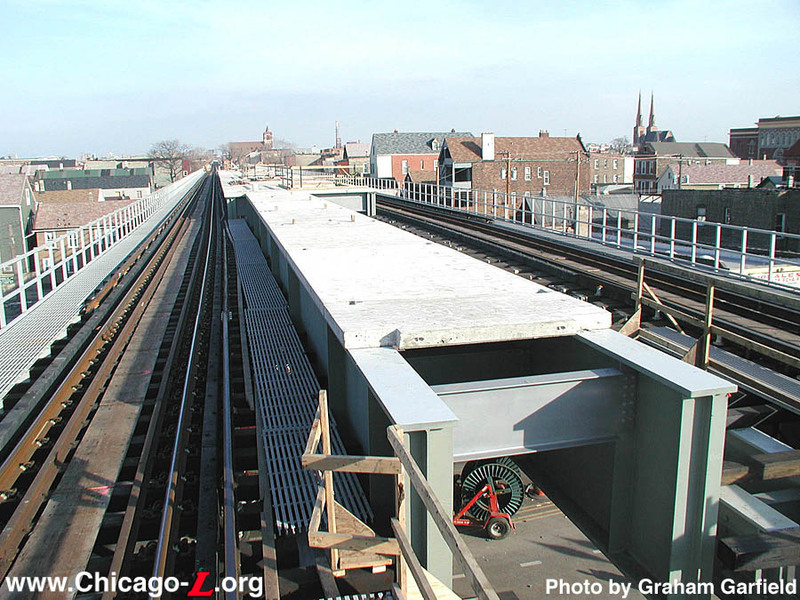 These platforms fed from the dual fare control areas at Leavitt (2200W) and Cullerton, a half block west of Hoyne (2135W/2000S). This second entrance is unusual in being the only temporary station entrance not located under the tracks (like most of the temporary stations), but from the street running parallel and to the north of the right-of-way. The fare control areas consisted of concrete and asphalt floors, chainlink walls, and wooden agent's booths. The platforms had wood decking and railings, wooden canopies, and temporary signage largely relocated from the closed Western and Hoyne stations. 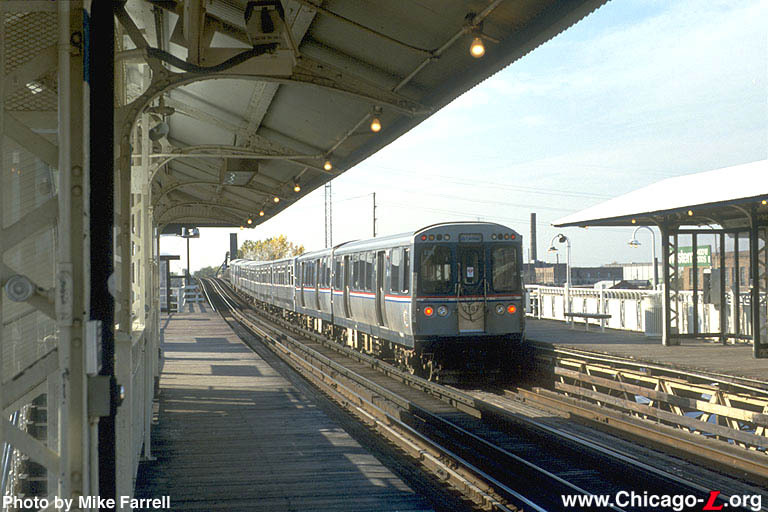 During the weekend between the old stations' closures and the temporary station's opening, after Western station was closed and locked, CTA forces removed the fare controls and AVMs in that station and relocated them to the Leavitt entrance to the temporary station. The temporary station remained in use while the old station was demolished and new station built in its location over the following year and a half. Crews moved in quickly to begin demolishing the old station. 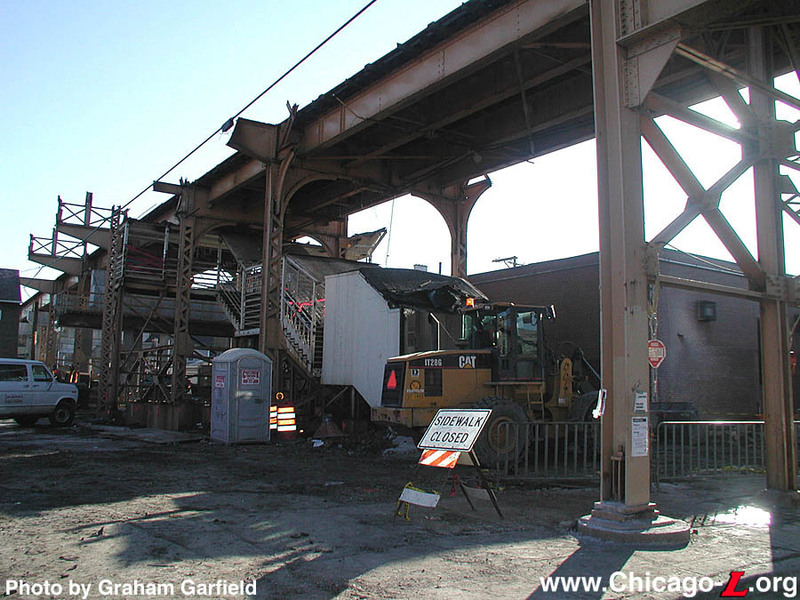 Over the weekend of December 7-8, 2002, demolition of the elevated platform, stairs, and station house began. 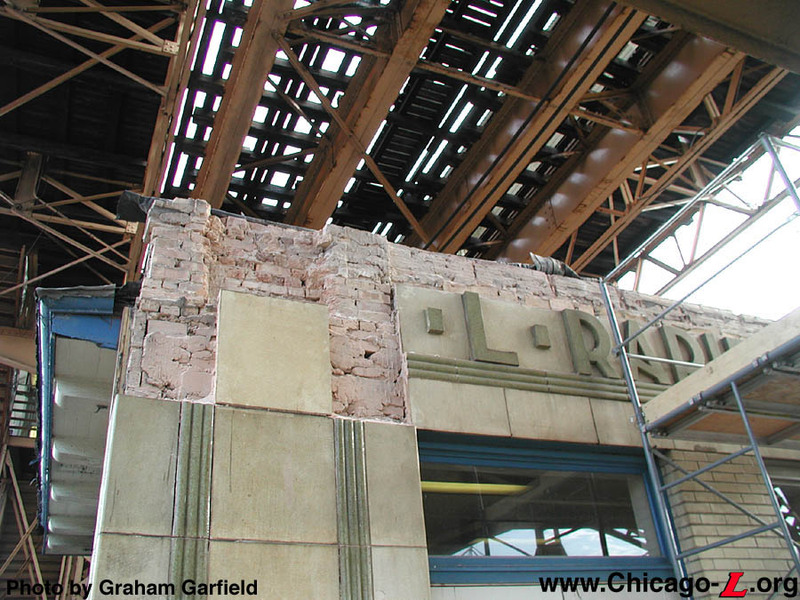 The green Art Deco lettering along the top of the station facade was later removed before the rest of the station house was demolished. Once the old station was removed, Kiewit-Delgado, the Douglas project's primary construction contractor, could begin construction of the new elevated right-of-way, which bows out from the previous alignment to run around the new, wider island platform. 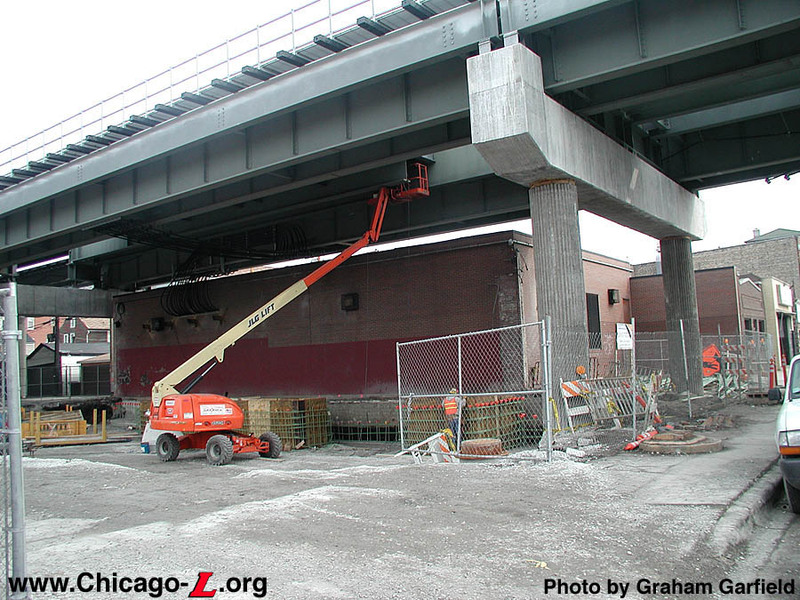 Work on the new elevated right-of-way continued into early 2003. Work was also underway at this point on the new island platform. 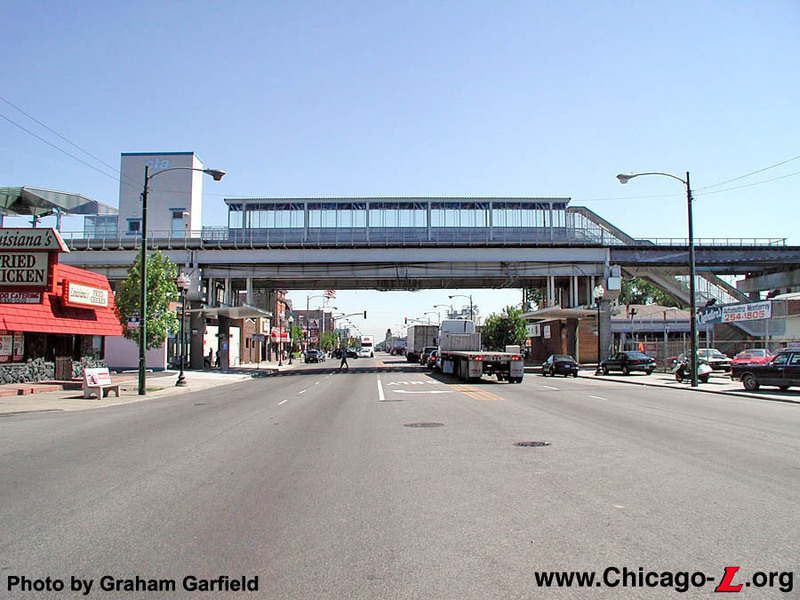 By late winter, nearly all of the platform structure and platform decking was installed, including for the walkway over Western Avenue to the auxiliary entrance/exit on the west side of the street. 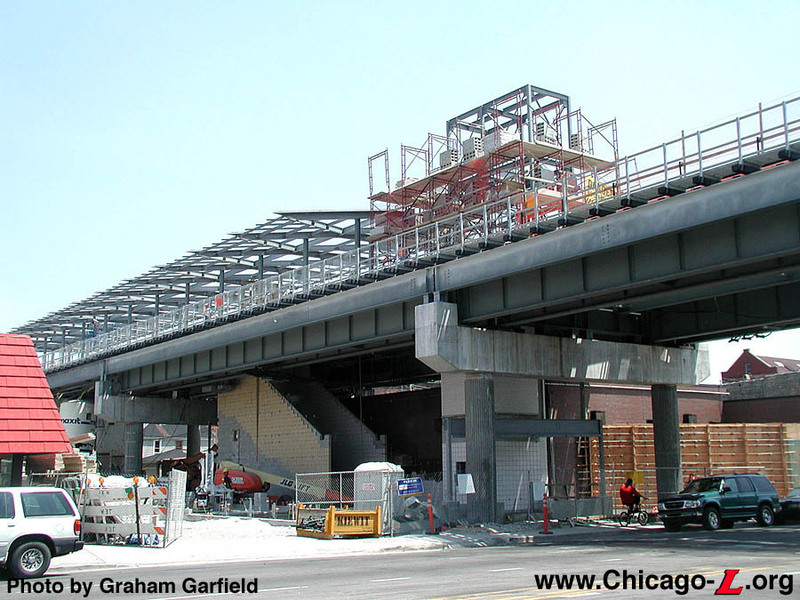 By March 2003, work on the new station house at Western was underway, including excavation for the building's foundation. By late spring, steel for the new canopy began to be erected. By June, the station foundation was in place and the stairway between the street-level and platform and surrounding walls were in place. The steel framework for the canopy was in place, as was the elevator tower. During mid-Summer, work was undertaken to install the canopy's roofing and work on the elevator tower continued and by August, the steel frame for the station house itself began to be erected. Installation of the canopy glazing and completion of the soffit was undertaken by September. Work on the canopy continued into Fall and by the end of 2003 efforts were underway to complete the concrete platforms. In early 2004, work at Western continued on various aspects throughout the facility. 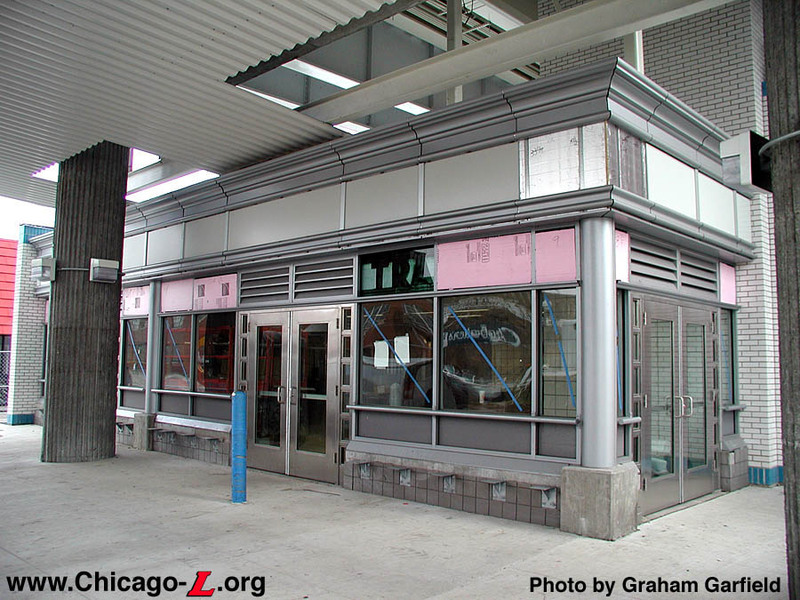 The station house continued to be finished out with additional storefront work and interior fixtures, and the installation of the fascia on the vertical faces of the platform canopy "triangles" and other nonstructural ornamental steel. 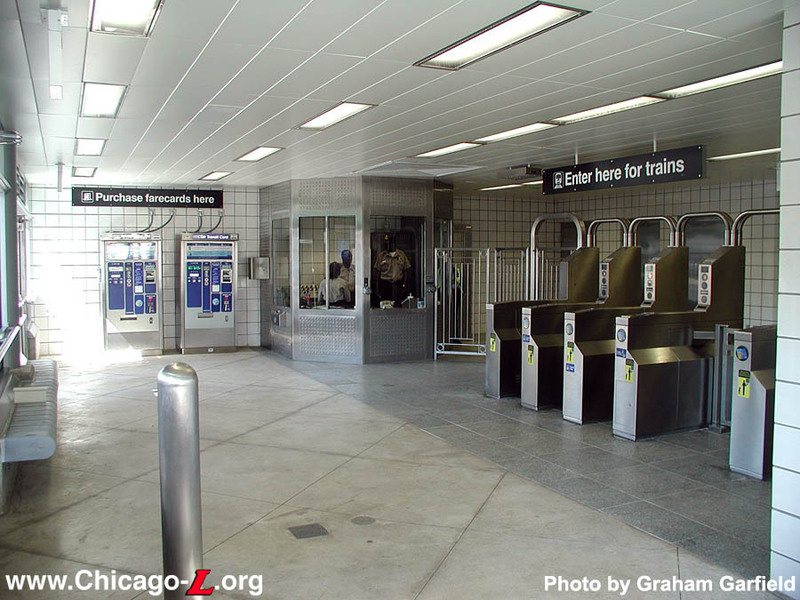 On June 4, 2004, the Chicago Transit Authority reopened Western station, the sixth of eight stations new, rebuilt stations in the rehabilitation of the Cermak (Douglas) branch of the Blue Line. 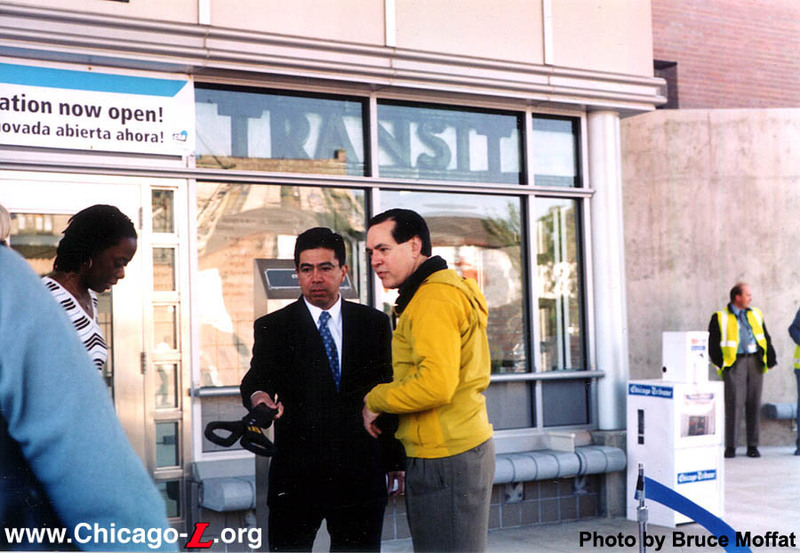 Chicago Transit Board Chairman Carole Brown and CTA President Frank Kruesi were joined by 25th Ward Alderman Danny Solis to announce the reopening of Western. 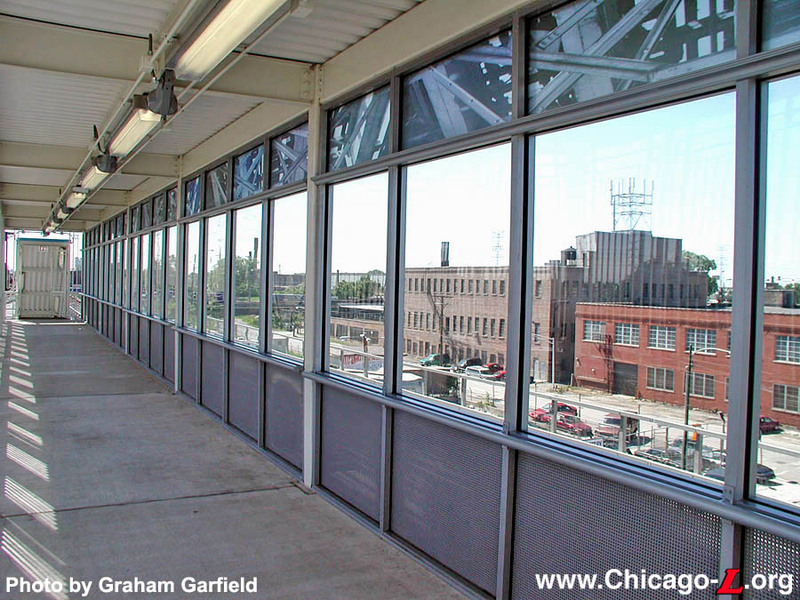 "The newly renovated 'L' station at Western is an excellent example of the work that the CTA is doing to bring its system to a state of good repair," said CTA President Frank Kruesi at the time. "These enhancements mean better service and will help us retain existing customers and attract new customers to the CTA." 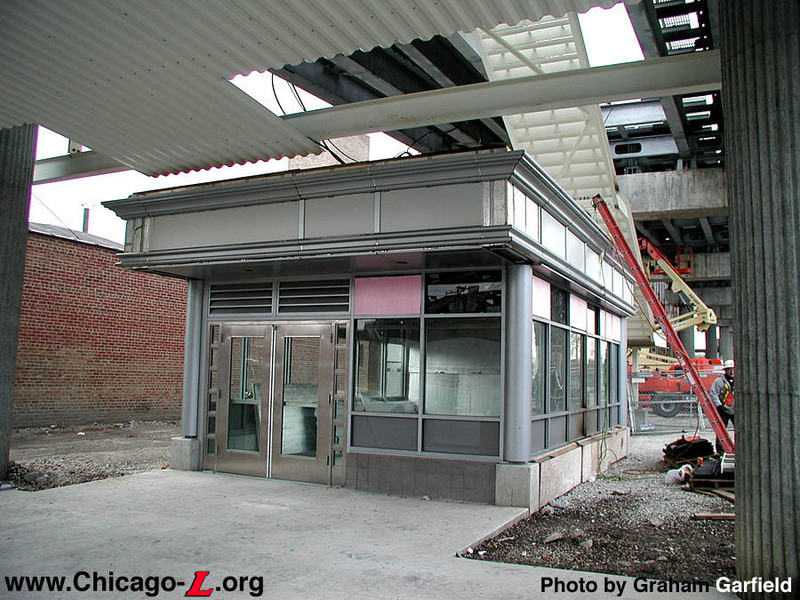 Coincident with the new station opening, the Leavitt entrance (2200W) to the temporary Western-Hoyne station was closed and converted to an emergency exit . 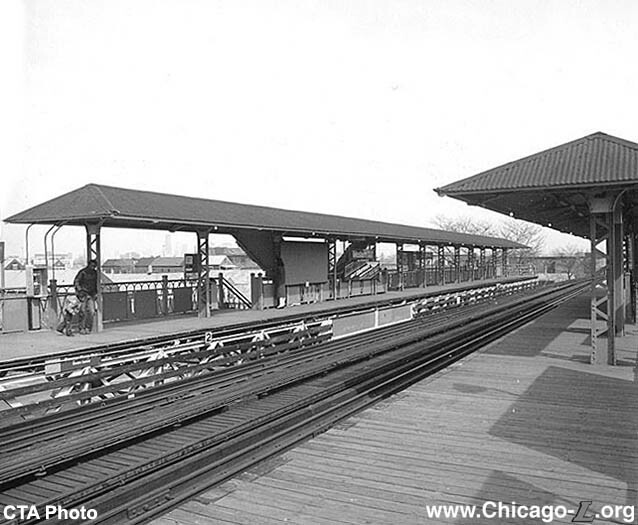 The station did not close entirely until July 22, when the new Damen station opened a half mile east. The temporary station was subsequently dismantled over the weekend of August 7-8, 2004. 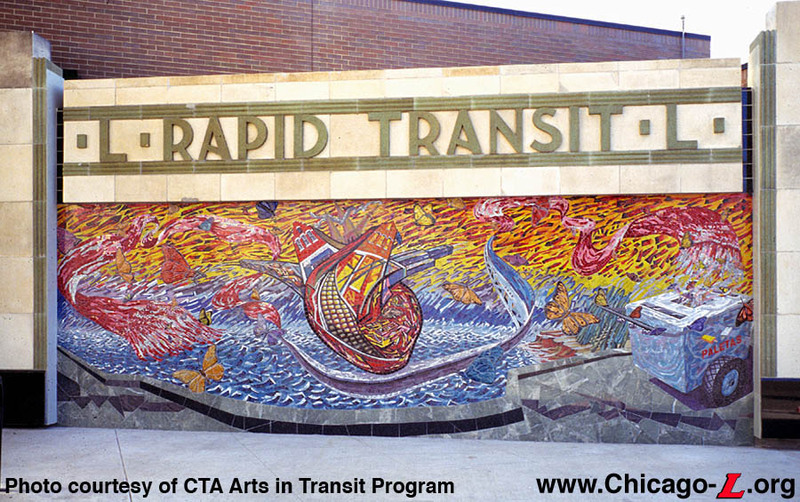 The Western station also had new original artwork installed as part of the Douglas branch renovation. Included through a unique partnership between the Chicago Department of Cultural Affairs' Public Art Program and the CTA , the Public Art Program administered the selection, design, creation and installation of public art for the project. Western's art installation, which is outside the station and in front of the adjacent substation to the south, is of particular interest to historians because it incorporates the 1930s Art Deco facade that adorned the previous station. 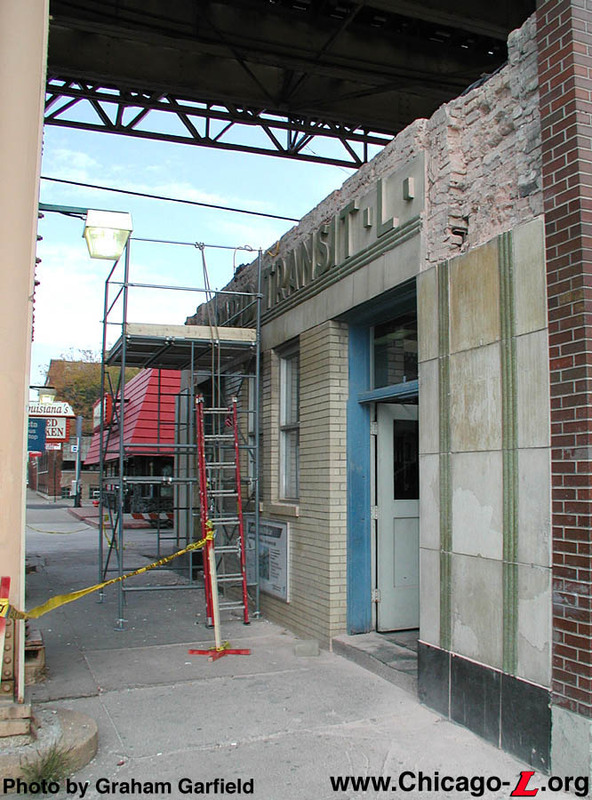 The facade was carefully dismantled before the station was demolished and put in storage while the facility was reconstructed. 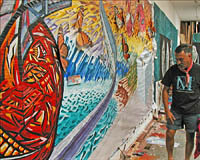 As part of the Douglas art program, it was reassembled on a purpose-built concrete wall in front of Western Substation. Inside the facade, where the doors and windows had been in the old station, a new Byzantine glass mosaic titled "Ice Cream Dream" by artist Hector Duarte was assembled. The facade and artwork were installed during November and December 2004. 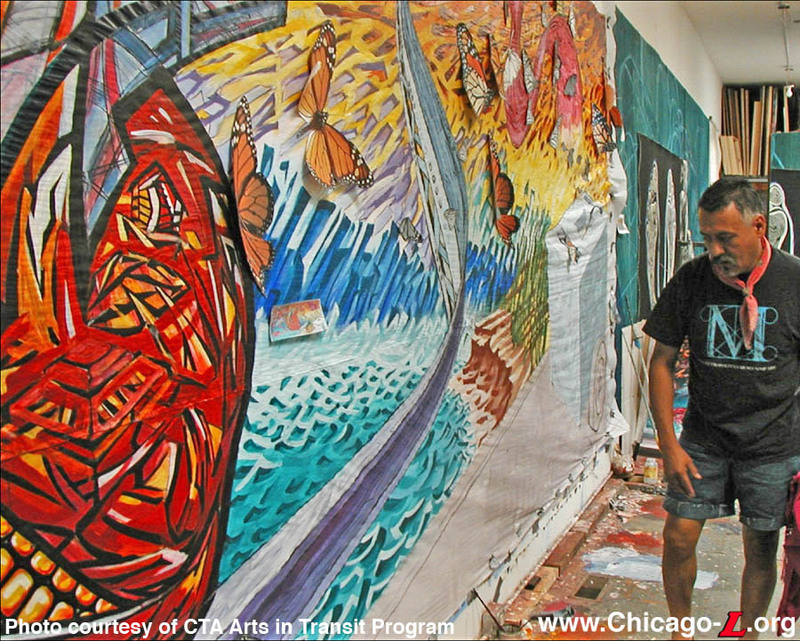 The CTA allocated $1 million for the Cermak Branch Art Project and retains ownership rights to all of the artwork created.